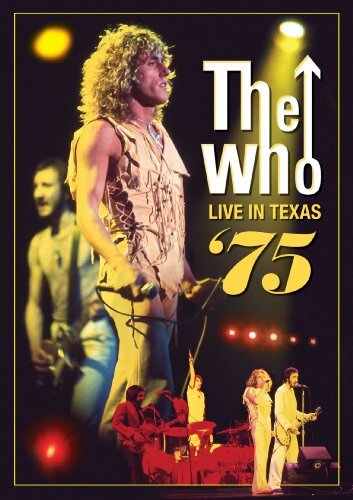 New York, NY (August 23, 2012)--Eagle Rock Entertainment is thrilled to present one of the greatest live bands in rock'n'roll history: The Who: Live in Texas '75 on DVD October 9 [Pre-book Order September 14, MSRP $14.98 for DVD, $12.99 Digital Video]. Pete Townshend. Roger Daltrey. Keith Moon. John Entwistle. Filmed in Houston, Texas 11/20/75, it was right at the start of a massive tour of the U.S. to promote The Who By Numbers, their seventh album in their 10th year of existence. With Dolby Digital Stereo sound, this 117-minute 25-song bomb blast--previously only available as a muddled bootleg--has been pridefully restored to its rightful visual and sonic superiority by longtime Who collaborator Jon Astley. Filmed only five years after what arguably is the greatest live album in rock, Live At Leeds, The Who: Live in Texas '75 , lives up to and in some ways actually surpasses its predecessor's greatness. The Who, at that particular point in time, had achieved an unerring almost magical mystical chemistry. Between the windmilling antics of guitarist Townshend, the mic wire lasso of lead singer Daltrey, the crazed bombastic danger of drummer Moon (1946-1978) and, of course, their secret weapon, genius bassist John Entwistle (1944-2002), this was a truly revolutionary band who changed all the hard rock rules. Even the punks, in the anti-rock star era of the late '70s, loved The Who. The extensive Tommy section...the savage recreations of early hits such as My Generation (with its iconic hope I die before I get old line delivered in all its lusty nihilistic truth)...the celebrated cover of Eddie Cochran's Summertime Blues...plus Baba O'Riley and Won't Get Fooled Again make this a Who fan's delight.